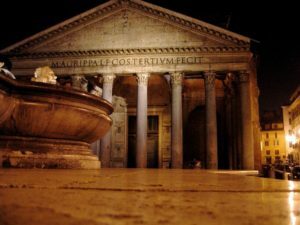 Are you looking for a Ghost hunting experience in Rome? This is the right post to read! For centuries they are part of our reality: discreet, scary or intrusive, they are everywhere; each with his story, his loves, his sufferings. It is said that Rome, the eternal city, for its millennial history, is populated by numerous ghosts and mysterious spirits that wander at night with the full moon. They walk undisturbed and return to the places of their past life. But if they meet someone on their way, they certainly do not miss the opportunity to frighten him, or to make the chills come through him through the soul. So be careful to walk around the alleys of Rome at night, never meet one of the terrible ghosts of Rome. Once upon a time the first emperor of Rome. His ghost seems to wander inside Saint Peter’s Basilica spying on every tourist who visit it. Giulio Cesare’s ghost legend dates back to Imperial Rome. The remembrance of the magnificent emperor, is linked to an unusual place: Piazza San Pietro. Until 1585, on the top of the obelisk that adorned the square, there was a golden globe inside which, according to tradition, were conserved the ashes of the great leader, as handed down by legends and suggestions. Inside the basilica, however, is the column of assesses coming from the Temple of Solomon, and so it is said because the obsessive bonds were bound to it while being exorcised. 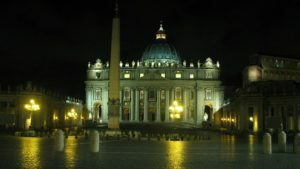 It is perhaps this ancient tradition that has generated the long series of fantasies about ghosts that would still be in the basilica of Saint Peter today. 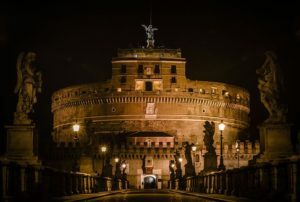 Going along the road to Conciliazione, you come to Castel Sant’Angelo, the true crossroads of damned souls! Here, in fact, at night, it seems possible to meet a man wrapped in his large scarlet mantle, intent on offering cigarettes to passers-by, is the spirit of Mastro Titta (the worst executioner of the history ever existed), the most famous man in Rome, willing to put a last cigarette on the poor condemned. Along with him, but only on September 11th, you can see the ghost of a young girl whose head swells from one arm: this is Beatrice Cenci, a Roman noble woman who was decapitated by papal justice on September 11, 1599, rea confesses of her father’s assassination. He was a bully and violent man, killed just to put an end to the continuing anger imposed on his daughter and other family members. Although everyone in the city knew Cenci’s brutality, no one could do anything against the Pope’s firmness, which condemned the poor woman to decapitation. And so her sad spirit still wanders along Ponte Sant’Angelo, looking for some comfort. Another area of ​​the center of Rome that is particularly populated by the damned souls is the Pantheon, an ancient temple devoted to all Roman goddesses, then transformed into a church dedicated to the Virgin of the Martyrs in the 7th century: according to tradition, Pope Bonifacio IV to convert the building of the new cult, buried under the floor numerous bones of Christian martyrs. The pagan demons, who up to that time infested the Pantheon, fled abruptly, even creating the big oculus on the vault, once caught in a large bronze cone! In recent times, however, lies the legend of the ghost of Umberto I Savoia, dead assassin and therefore unable to enjoy the eternal rest. At dawn there are those who swear to have seen his ghost go around the Pantheon and it seems like an unfortunate guard, has been chosen by the king to guard an important secret, unfortunately went irretrievably lost since for the scare the poor man lost the word! 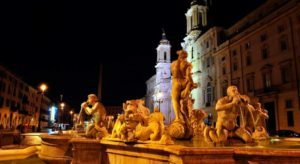 Come to Rome to discover the misterious stories of Roman ghosts hidden among Rome’s monuments with a night guided walkway specters and restless souls in the Street of Rome.